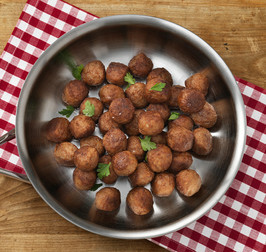 Classic Swedish meatballs of beef. Made of organic ingredients. From frozen: Steam oven: 150 ° C for 20-25 minutes Convection ov,en: 150 ° C for 20-25 minutes Oven: 175 ° C for 20-25 minutes. T,o core temperature: 70 ° C.